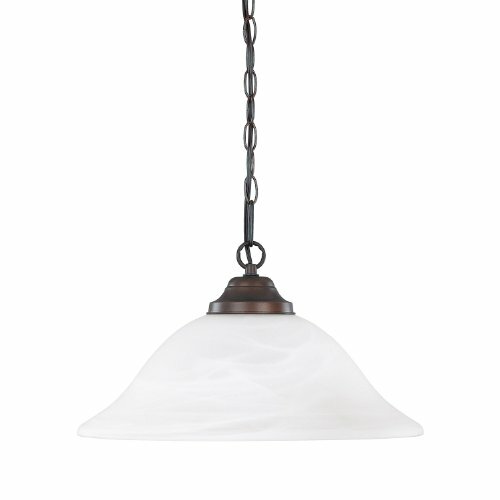 This 1 light mini pendant from the Monroe(TM) lighting collection is a unique twist on traditional Americana. The distinctive metal base is touched with a Brushed Nickel finish, which beautifully complements the Light Umber Etched Glass adornment. With this design, we have turned tradition on its head to create an updated look. Aspen Creative is dedicated to offering a wide assortment of attractive and well-priced portable lamps, kitchen pendants, vanity wall fixtures, outdoor lighting fixtures, lamp shades, and lamp accessories. We have in-house designers that follow current trends and develop cool new products to meet those trends. 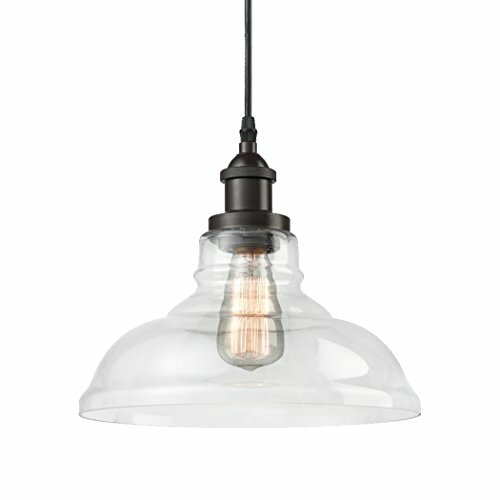 Aspen Creative offers an adjustable 1 light incandescent mini pendant ceiling light with a chrome finish. This fixture has a transitional design. It includes a smoke glass shade. The fixture body dimensions are 8 ⅝"" width x 11 5/8"" height. Each fixture provided with 72"" of field-cuttable cloth cord. Uses 1 - (E26) medium base light bulb – 60 watt max (bulb not included). Suitable for dining room, bedroom and living room, kitchen island and restaurant bar applications. 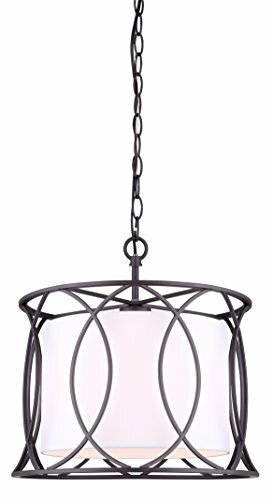 Monica 1 Light Pendant Size: 13"
Canarm ltd style monica IPL320A01ORB14 14" 1-light chain, drum pendant oil rubbed bronze - the monica features transitional styling and is sure to catch the eye. Its open, geometric cage design in oil rubbed bronze against the inner white fabric drum provides a pleasing contrast of dark against light. Comes with a 60" chain and 72" cord that allows adjustable length. Uses 1 100 watt type A19 bulb (not included). canarm has a long and successful history of supplying lighting and ceiling fans. They work diligently to create a comprehensive selection of styles and designs as well as maintaining high standards of product quality and value. 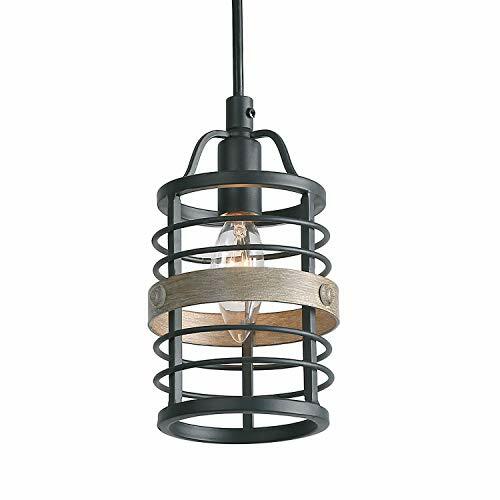 This 1-light mini pendant features a black and faux-wood finish that will complement any transitional decor. The cylindrical cage surrounding the bulb adds interest while providing any space with ample downwards lighting, completing this simple yet functional design. We do our best at LNC to provide you with effective fixtures for your home or business. Each fixture is designed to deliver a stunning quality of light that fills your space with gorgeousness and coziness. 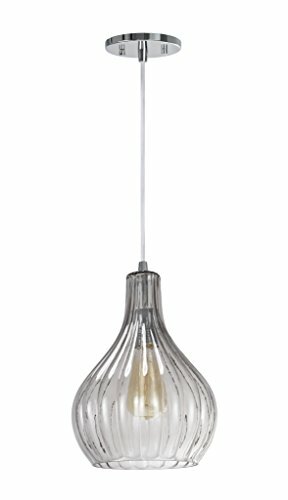 If you are looking for a pendant that defies the commonly held notion that says:" it takes a prominent chandelier and lots of room to make a statement", then you have just found the right product! Don't hesitate and add to your cart now before it's out of stock! Aspen Creative is dedicated to offering a wide assortment of attractive and well-priced portable lamps, kitchen pendants, vanity wall fixtures, outdoor lighting fixtures, lamp shades, and lamp accessories. We have in-house designers that follow current trends and develop cool new products to meet those trends. 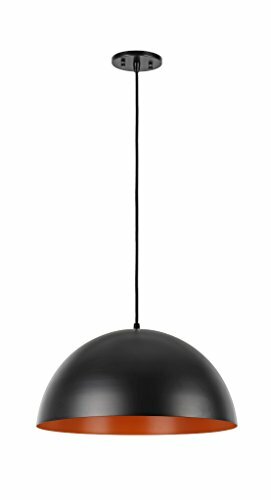 Aspen Creative offers an adjustable one light incandescent hanging pendant ceiling light with a matte black finish. This fixture has a transitional design. It includes a metal shade in matte black with orange inside. The fixture body dimensions are 17 ¾" width x 9 3/4” height. Each fixture provided with 72" of field-cuttable cloth cord. Suitable for dining room, bedroom and living room, kitchen island and restaurant bar applications. Size: 16\" x 11.5\" x 8\"16" x 11.5" x 8"
Want more Transitional 1 Light Pendant similar ideas? Try to explore these searches: Lightning Window Graphic, 3/4 Sleeve V-neck Cardigan, and Open Water Swimming.